What a lovely, warm man! 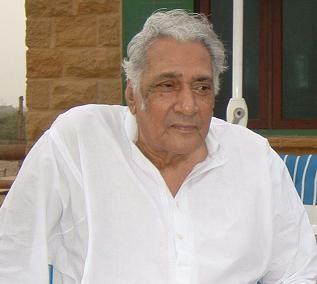 I am really sorry to hear about the passing away of Sarwar Bhai. I know he had not been well for quite some time but it’s still difficult to believe he is gone. His passing away (despite knowing the nature of illness) jolted us both in a manner which we had not anticipated. The amazing grit with which he fought till very last, redefined the very words, ‘grace and diginity’. But then, that is what great Sarwar was! I am happy I got to meet him and he let me hold a discussion at his house. We have lost a great humanist, and we will always remember him with love. I had met the kind old man just once, at your place, rather briefly. He appeared frail but gentle, alert and at peace with himself. Deeply grieved, Shifa and myself extend our warmest respects to the departed soul. Your father was a wonderful human being from the brief time I met him in Karachi, from what you told me of him and from what I read on your post. It is a blessing he went peacefully. It was so like my Dad’s passing away and almost at the same hour…. It is sad to learn about the demise of your father! But at the same time it is so sweet to know that he has lived his life in style. The obituary note in the Dawn suggests that he has always strived for civil liberties. No wonder that you have inherited this legacy! You are so lucky to be the daughter of this wonderful human being. May God reward him for his services to humanity! You never told us that your father was this, so…. much. Though we should have guessed that your activism must have initiated from such a background. Your doing a great job keeping up our heritage! Thanks for your comment – and your blog link, lovely work. If you are Karachi, please do come to the event on Jan 9, 2010 at the Arts Council (see blog home page for details). I was so glad to have found this blog. I was trying to get something on Faiz and I bumped into the blog on Mr Sarwar’s. Where I found all of you. Please come to India and give us an opportunity to take care of all of you. in 1953, I was a second year student of Government Commerce College, Karachi. I was not involved in students’ movements but my sympathy was always with DSF. That is when I heard about a student leader of Dow Medical college Dr.Sarwar, who was leading the protest. That name always remained with me. Though I never met Dr. Sarwar, I did take part in 1953 student procession and remember 8 students killed by police firing. During that march at one point during procession in Sadar, Karachi Mian Iftkar appeared and he gave a speech. i was unfortunate that i did not meet Dr.Sarwar, but my younger brother Salahuddin Ahmed who lives in Sydney, Australia always talked about Dr. Sarwar. It gives me a feeling that i have met Dr. Sarwar in sprit. This sad news brought back a flood of memories. Jail. Personal sacrifices. Broken families. Empty pockets. Political rallies. Tear gas. Whiskey. Poetry. Art. 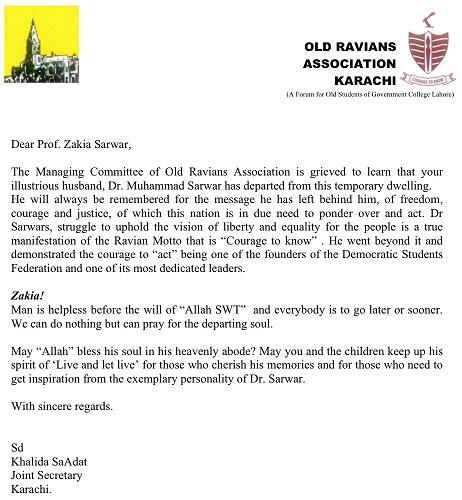 Look beyond, and even peel away the veneer of “isms,” at the very core Dr. Sarwar and his friends were idealists. They were driven by a deep sense of justice; by a deep sense of duty to a new nation and its people and by patriotism that wasn’t displayed with a flag on the car. Most of all, they were strongly committed to leaving behind for their children – you and I – something better than they themselves inherited. Today, when they look at Pakistan, they feel they failed. But heck they tried – with sweat, blood and tears. Jafri sb,its never appropriate to accept failures,life is a continued struggle,even in hypothetical states,when you seem to acheive your goal,deteriorations,and maintainace require a constant vigil,nothing has failed,its just a transition. We the marxists,at least believe in this,we as doctors have our reasons too,as disciples of scientific methodolgy as well,why to lose hope,and let others crumble too, Dr.Sarwar and his companions were an inspiring lot of those who resisted,struggled,they have their inspired,and followers ones,dont worry,cheer up,we will not let his,and his comrades,and the predecessors,and followers fail,imagine Guevera,Bhagat,Hassan Nasir,dont follow,the depressed intelkacchooch`s,immersed in their new affairs with forces of “trickle down effects” or frank status quo. I hope,i have given you some hope.